Cleanliness is the key to employee productivity. Its value is detrimental to businesses, operational efficiency, employees, and customers. Learn how a modest investment in hiring the best cleaners, brings out the best in employees. 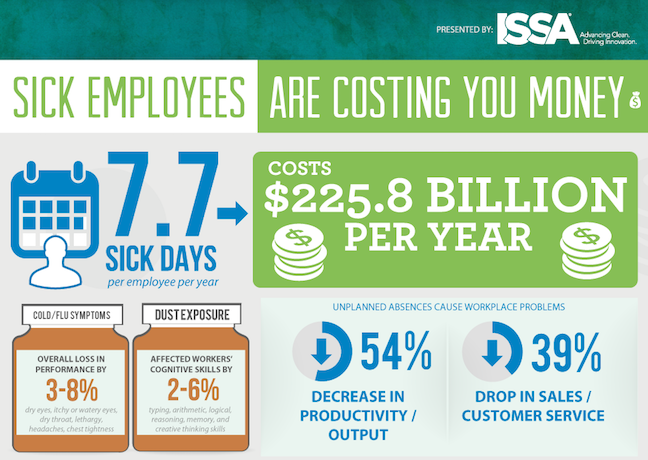 A study supporting more benefits of a clean workplace was conducted by ISSA, the Worldwide Cleaning Industry Association. A positive experience with a cleaning service, sends the message to blue collar and white collar employees, that their health, happiness, and well-being is important. Walking into an organized office, cubicle, or building, brings comfort to visitors and those who can say their place of employment is their second home. EE Cleaning is that place that will exceed expectations. Your satisfaction is our business. This is a great article! I manage people in my company and there is nothing like a ” I can’t come to work” call on a Monday morning. How often should we get cleaned?